My Wandering Life: First swim of the season! The pool across the street has opened for the season! 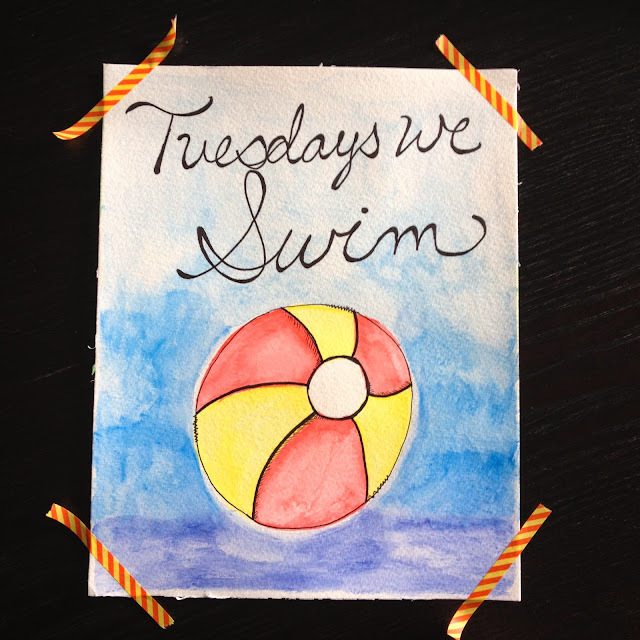 We joined up with three other families (only one other family shown below) and decided Tuesdays shall be Swim Day. Shanghai has mostly completed its seasonal mass exodus of the expats, who all generally return to where they came from the minute school lets out, returning a day or two before it starts up again. Not us however! 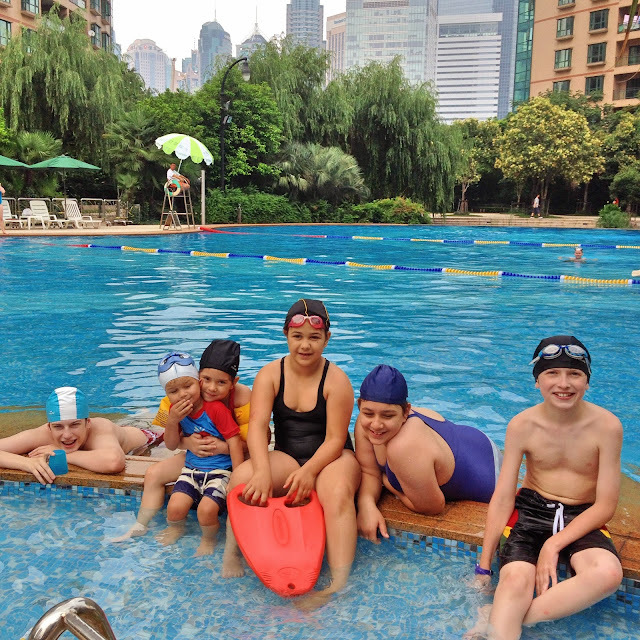 We are here for the duration and enjoying weekly planned events with those like us who call Shanghai home year round instead of just first of September through first of June. Not that we wouldn't also enjoy doing some summer travel... But sadly flights go up, up, up whenever there are expat holidays, and the provision of Michael's contract doesn't include a paid annual trip "home" like many others (I have one friend whose work contract includes four paid home leaves per year. Which makes me wonder, is Shanghai really so bad that people feel they have to vacate it every season for the place they came from? And if so, then does Shanghai ever really have a chance of feeling like home if you spend so much physical time in another place that you always refer to as home? I'm guessing no. Which must make for a miserable experience here). Last year was our big travel year, working our way around the globe to visit all the Disney theme parks worldwide. This year we're staying closer to home, seeing more of Asia. And next year? Who knows. For now I'm content to lounge by the pool every Tuesday and enjoy the city in summer. We go back to the US on 'home leave' every summer, but it's usually only for a few weeks. Having grown up 'expat' we have family member scattered virtually coast-to-coast and from Canada down to Texas; it's nearly impossible to see everyone, yet every summer we seem to try. We love our families and enjoy seeing them, but 3=4 weeks of living out of a suitcase and constant travel is just soul-sucking - no matter how happy you are to be doing it and no matter how much you love everyone. We have some friends who live in efficiency apartments here and have left their entire homes in the US just as they always were. They fly home - as you say - as soon as school's out and return in September for a couple months, then leave for most of December and January. I don't really think of them as 'expats' though: more like business travelers. For us, 'home' is Seoul - until 'home' is somewhere else. The pool looks gorgeous, btw - love that landscaping! How lucky you are to have other fun families nearby to enjoy in the summer! We first arrived here in May, met tons of people, and then nearly got whiplash as they all left the country first of June. Those remaining behind I dubbed "the bitter women club" because they were so unhappy to be stuck here when their friends were gone. I felt like chopped liver! This is our third summer here, and I have to say there's something beautiful that springs up in the community of those staying here when they band together in summer or at Christmas. Sure I love America, but with limited time and funds, we certainly want to spend both elsewhere for the time being! I'm sure I'd think a bit differently if the company were funding the trip, but alas, we are foreign local hires, meaning we're on "home leave" every day in Shanghai! Heh heh! Rachel, in Asia swim caps are a must. Can't go in the water without one, even on the baby of the group. Your guess is as good as mine! Maybe they think it keeps the pool cleaner? No clogging of the drain? Dunno. Our answer is the same as always, "This is China." I was wondering about the swim caps too. My girls have swim caps for swim team but generally don't like to wear them.